(Geneva Centre) – On the occasion of the 2019 World Day of Social Justice observed on 20 February, the Executive Director of the Geneva Centre for Human Rights Advancement and Global Dialogue Ambassador Idriss Jazairy stated that the promotion of international solidarity and social justice are vital to the building of peaceful and inclusive societies. The rise of protest movements in developed societies – he said – is a telling testimony that economic growth can often generate deep inequalities and marginalize the lower middle class and the working class and in particular vulnerable groups such as female-headed households. “In view of the fact that the value-chain of wealth creation knows no borders, such policies will be self-defeating and may end up in violent confrontation,” suggested the Geneva Centre’s Executive Director. The recent social tensions in Europe is a telling testimony that freewheeling globalization has translated into rising inequality of income and social exclusion. “Indeed, while the acceleration of globalization and advances in information technology did have some upsides contributing to economic growth and material well-being, it triggered a whole range of complex problems. These include, in particular, growing inequality, increasing poverty, mismatch between qualification and employment opportunities, social disintegration and environmental degradation. The effects of materialism has adversely affected compassion, solidarity and spirituality,” Ambassador Jazairy underlined. To address this ominous situation, the Geneva Centre Executive Director stressed the importance of identifying a more sustainable and inclusive model of globalization. Domestic and international solidarity – he said – need to be reinvented as reaffirmed in the Sustainable Development Goals of the 2030 Sustainable Development Agenda of the United Nations. 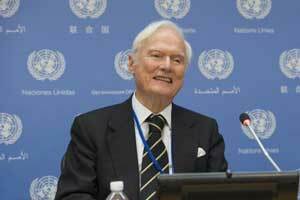 In this connection, Ambassador Jazairy said: “We need to seize the opportunity to address the causes of social instability and economic backsliding. People must be empowered so as to enable them to realize their potential and take ownership of their destinies. The gap between the growing elites and ordinary people must be bridged. “Identifying, addressing and eradicating the root-causes of social injustice will enable us to promote a more equitable development that puts the human being at the centre, and creates synergies between societal development, human security and peaceful societies. There can be no social justice without promoting peace and enhancing equal citizenship rights,” concluded the Geneva Centre’s Executive Director in his statement. The post “There can be no social justice without promoting peace and enhancing equality,” says Executive Director of the Geneva Centre appeared first on Inter Press Service.